Straight stock layout? Check. Battlecomp muzzle brake? Check. This RFB didn’t rise at all on firing. The SWFA scope also helped: unusually for a 1-4x, it’s a front focal plane design with a twist: at 1x, it has thick cross-hairs and a small illuminated circle in the middle, at 4x the cross-hairs are not visible but the milradian-calibrated fine crosshairs become visible in the middle of the enlarged circle. The optics were very clear, so I became an instant fan. The rifleman? He organized the Bullpup Shoot at Rockcastle. This entry was posted in interesting people, rifle and tagged 308Win, Battlecomp, brake, bullpup, keltec, muzzle, RFB, scope, zoom. Bookmark the permalink. Maybe I’m missing something, but why would you describe “first focal plane design” as something distinctive? I can’t think of any other way to implement a crosshair. Alright, the scope can “zoom” from 1x magnification (no magnification) to 4x magnification. In many scopes, the crosshairs do not change when you “zoom” with the scope. 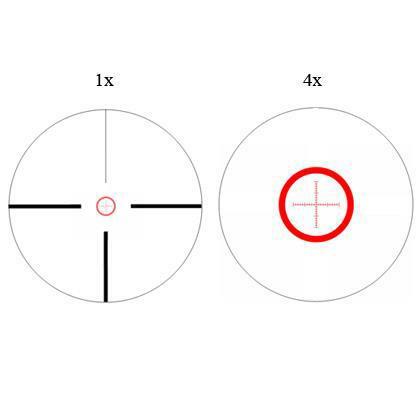 In a scope with crosshairs in the first focal plane, the crosshairs get bigger when you “zoom” in. Wish I had known – I would have brought out the Mosin Monstrosity.